The Lazy Days of Summer… | Learning. Reflecting. Connecting. 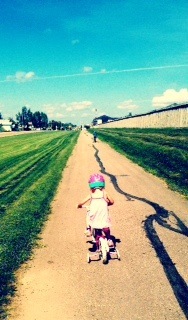 Today I went on a bike ride with my two youngest monsters (well, they biked and I walked). As I watched them get ahead of me, I found myself amazed by how much my monsters have grown over the summer. Our six year old has gone through a growth spurt where his toes finally reach the ground when he is on his “new” bike and our three year old is riding her own bike (with training wheels). I was saddened a bit that my babies have grown so much and I thought about how much I have enjoyed my time with them this summer. We have had a wonderful break. As a family we created a summer bucket list. We have crossed almost every item off…and we still have time. :) We didn’t go anywhere spectacular or do anything amazing, but it was a special summer break. These warm, sunny feelings were then replaced with the sad thought that these lazy summer days will soon be over…and back to work I will go. Now I haven’t really stopped thinking about work over the summer break, I don’t believe any teacher truly does. While we may not be in the school, in front of students, our brains don’t easily refocus or shift out of school-mode. But it is easier to find a more healthy balance during the summer months. School thoughts and ideas can be pushed aside. We can enjoy our lazy summer days with out recess bells, supervision, thousands of emails to answer or an endless stream of meetings. As I move into a new school year, one of my goals it to find a healthy work/home balance. There should be times where we can push our work aside (for a bit) and enjoy our home and family. To help me find that important balance, I am going to use this post as a reminder to enjoy some lazy days no matter what the season.